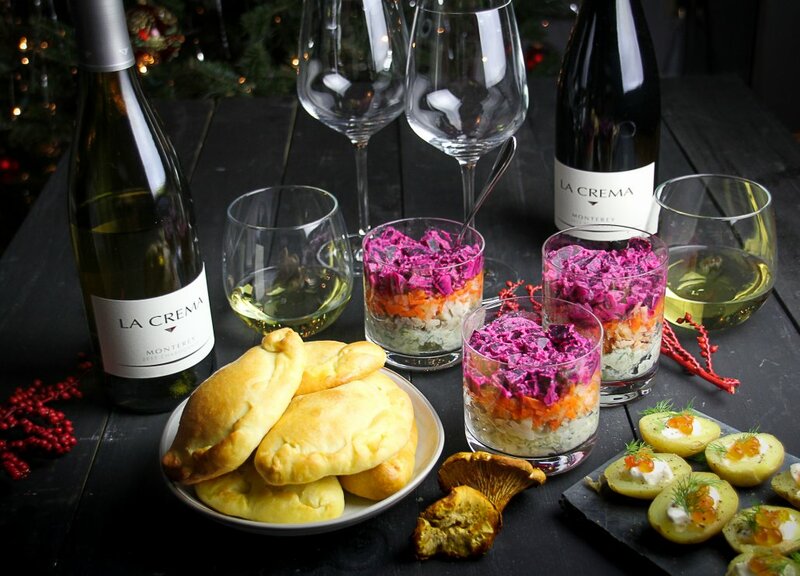 The last part of our Russian New Year’s Eve menu is a total crowd pleaser. Mushroom Pirozhki are easy to eat, easy to carry around a party, warm, satisfying, and pleasantly bready — always good for a night out. These little bites of mushroomy goodness are an adaptation of my favorite Russian recipe, Rabbit and Mushroom Pie. When I was spending a lot of time in St. Petersburg for work, a slice of rabbit pie for dinner was a favorite treat, so I developed a version that I could make at home. Finding and cooking a rabbit is a lot of work, though, so for the purposes of this menu, I thought a simpler, party-friendly version would be a better fit. Russian pie dough is pillowy and soft, not flaky. Enriched with butter, egg, and sour cream I find it somewhat similar to a calzone dough. It’s pretty easy to make, and once you have a batch in the fridge, you can fill it with a number of different fillings, both sweet and savory. 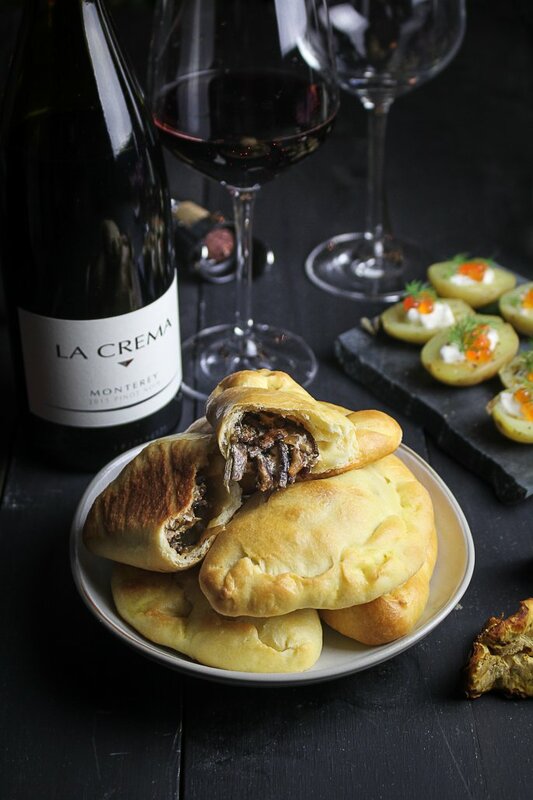 The filling for these Mushroom Pirozhki pies is an addictive mixture of wild mushrooms, sour cream, wine, and dill. 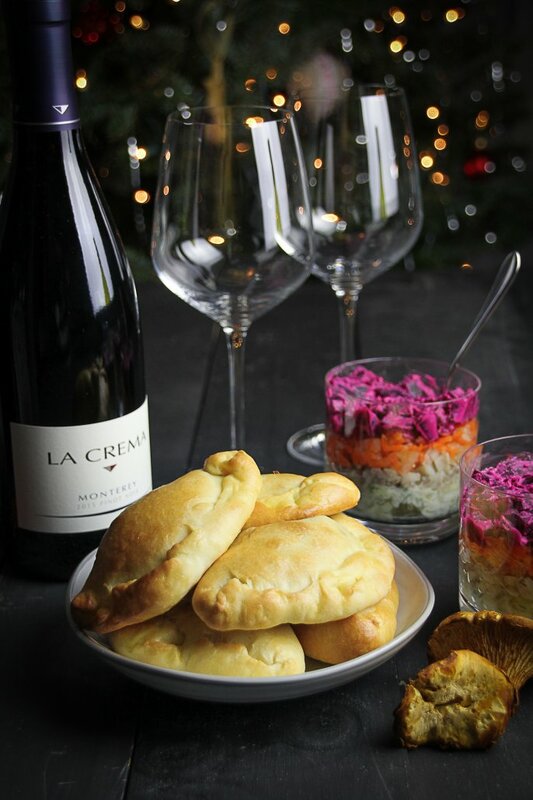 Mushrooms are deeply earthy, so they pair well with a medium-bodied red wine like La Crema’s Monterey Pinot Noir. However, since here they’re mixed with sour cream and white wine, they also go nicely with the Monterey Chardonnay. It’s always good to have choices, right? A vegetarian, party-friendly miniature version of this Russian Mushroom and Rabbit Pie. My favorite Russian pie dough recipe comes from It’s Sooo Good – I’ve linked to the recipe below. Melt the butter in a large frying pan over medium heat. Add the chopped onion and saute until soft and translucent, about 5-8 minutes. Add the sliced shiitake mushrooms and saute until they are crisp and golden brown, about 10-15 minutes. Next, add the diced crimini mushrooms and saute until soft, about 10 minutes more. Add the white wine and let simmer for 5 minutes, until reduced by half. Remove from heat and stir in the sour cream. Season to taste with salt and pepper. Preheat the oven to 350F. Split the kulebyaka dough into twelve equally-sized pieces and roll them into balls. One at a time, roll a ball of dough into a thin circle about 4-5 inches in diameter. Place a heaping spoonful of mushroom filling in the center of the piece of dough. Brush the outer rim of the dough with the beaten egg yolk, then fold the dough over the filling into a half-moon shape. Firmly crimp the edges to form a dumpling and enclose the filling. Fold the round edge over once to prevent leaks. Place the pie on a baking sheet lined with parchment paper and brush the top with the egg yolk mixture. Repeat with the remaining dough and mushroom filling. Bake the pirozhki until golden brown on top, about 15 minutes. Remove from the oven and let cool for 5 minutes. Serve warm.